Afghanistan’s capital Kabul has suffered three deadly attacks in a little over one week. In the most recent violence, 11 members of the Afghan National Army were killed at a military academy early Monday morning. Sixteen others were injured. The deadly attack involved a suicide bombing and a long gun battle. It took place near the Marshal Fahim National Defense University. The Associated Press (AP) says a group linked to the Islamic State terror group, known as Khorasan Province, claimed responsibility on the internet. Deadly attacks have taken place at the same academy more than once in the past. In August 2014, U.S. Army Major General Harold Greene was shot and killed in an attack claimed by the Taliban. President Ashraf Ghani denounced the attack. He said the “Taliban must choose between Islam and terrorism.” He spoke at a press conference with visiting Indonesian President Joko Widodo. The Indonesian president had just visited Pakistan where he proposed the creation of an Islamic committee for the peaceful settlement of the Afghan conflict. Afghan policemen inspect the site of a bomb attack in Kabul, Afghanistan, Jan.28, 2018. On Saturday, a car bomb ripped through a crowded area outside a government building, killing or wounding hundreds. Afghan security personnel stand guard as black smoke rises from the Intercontinental Hotel, Jan. 21, 2018, after an attack in Kabul, Afghanistan. Gunmen stormed the hotel and set off a 12-hour gun battle with security forces that continued into Sunday. The Taliban was blamed for a bomb attack in Kabul Saturday that killed at least 103 people and injured more than 200. Officials say an ambulance filled with explosives caused the damage. One week earlier, a group of militants stormed the Intercontinental Hotel in Kabul killing 22 people. Fourteen foreigners were among those killed. The U.S. State Department has confirmed that Americans were among those killed but details have not yet been released. 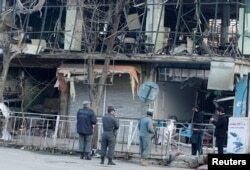 The head of Afghanistan’s intelligence service, Masoom Stanekzai, said five suspects have been arrested in connection with the hotel attack while one suspect had fled the country. He said four others have been arrested in the ambulance bombing case. The recent attacks show security is still a concern in Afghanistan more than 16 years after the U.S.-led military action overthrew the Taliban. The Taliban has carried out an insurgency since it was driven from power after the September 11 terror attacks on the United States. Mario Ritter adapted it for VOA Learning English from an AP report. Hai Do was the editor.